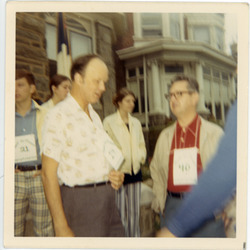 Photograph of various Wyoming people, prominently featuring Pastor Gordon Kirk (left) and Perry Blum (right). Appears to be surrounding a neighborhood outreach, perhaps in conjunction with an evangelistic crusade. “Pastor Kirk and Perry Blum, c. 1976,” Wyoming Avenue Baptist Church Digital Archives, accessed April 18, 2019, https://omeka.wabcphilly.org/items/show/107.